Non-Player Captains (NPCs) are Captains and ships not belonging to any player. NPCs can be either Naval ships or Pirate ships and are physically present on the Game Board as plastic miniatures. The following describes all the rules governing their behavior. 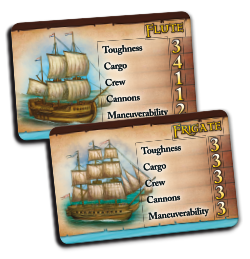 NPCs are brought into play by Event Cards, such as the "Dutch Naval Ship" and "Pirate Sloop". The Event Card deck holds 12 Admirals (3 of each nation) and 6 Pirates (3 Sloops, 3 Frigates). Each card holds information on the skill values of the Captains, which is why they are placed face up on a designated area on the board when drawn. When such a card is drawn you follow the instructions on the card. Basically, it tells you to place an NPC ship in a specific Sea-Zone at the end of the turn. To tell the brown Naval ships apart, a large Naval Token is placed below each one as they enter the game. The Pirate Frigate and Sloop are black and need no tokens as they are distinguishable from Naval ships and from each other. There can only be one Naval ship from each nation in play at a time, and at most two pirates - the Sloop and the Frigate. If you draw an Event Card of a ship already in play, you (at the end of the turn) place that Event Card on top of the old one and move the miniature to the Sea-Zone of the new card. This represents that the previous ship was called to duty elsewhere. 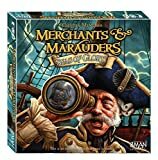 If the new Captain dies, he is replaced by the card below it and the miniature is moved back to that Captains home-port - again, at the end of the turn. If there are two cards below it, then randomly draw one of them to determine who the replacement will be. During the game NPCs will "Scout" for and move towards Player Captains living up to a set of criteria called Hunt Priority. NPCs are hostile towards any player Captain living up to one or more of its Hunt Priorities. Player Captains that have a Bounty from the Naval ship's nation. Player Captains that have Bounties from other nations. If At War: Player Captains of enemy nationality. Non-Pirate Captains with Gold on board. Non-Pirate Captains with Cargo on board. Non-Pirate Captains with no Cargo or Gold. The Player moves into the Sea-Zone of a hostile NPC (including moving from port out to sea). The Player starts his turn at sea in the same Sea-Zone as a hostile NPC. If the NPC succeeds its Scouting roll a battle ensues. If the NPC survives, all its damage is repaired upon its next battle. Note that the Scouting skill of Naval captains has an icon next to it. It means that the Scouting skill of the captain is either the value listed or a value equal to how many matching Bounty Tokens the target has - whichever is the highest. For instance if a player has 5 Dutch bounties a Dutch Admiral would have a Scouting skill of 5 vs. that Captain. NPC pirates in the same Sea-Zone as any Naval ships will not "scout" for players. Two Man-o-Wars (brought into play by the "War" Event Card) in the same Sea-Zone do not "scout" for players. If multiple hostile NPCs in the same Sea-Zone find the same player, then determine the order in which the battles take place randomly (by shuffling the NPC Event Cards in question, and drawing them in random order). Half of the Event Cards feature three NPC icons at the top. These icons activate specific NPCs and move them in the order they are listed on the card (if they are present on the board). Each NPC will move in the direction listed on its icon: North, South, East, West. All Sea-Zones borders have directional letters printed on them. If an NPC cannot move in the direction printed on the card, it will move clockwise to the next available Sea-Zone. An NPC will ignore a directional letter if it is in the same or adjacent Sea-Zone as a player living up to one or more of its Hunt Priorities. Instead it will move - or stay - so that it ends up in the Sea-Zone of the targeted player. Example: A Dutch Naval ship in Basse-Terre is activated and supposed to move North. In Bridgetown, an adjacent Sea-Zone, a Pirate Player with an English bounty is located (in port, but that is of no consequence). This means the pirate lives up to the second Hunt Priority of the Naval ship. Therefore the Naval ship does not move North, but instead moves East so th in Bridgetown. If several players within reach live up to an NPC's Hunt Priorities, it will move to the Sea-Zone with the player Captain living up the most to its 1st priority. If tied, move to the 2nd priority, and then the 3rd. In the event that two players tie on all criteria, then determine randomly who is targeted by draw of Captain Cards. NPCs in combat are controlled by another player with an interest in doing his or her best to secure victory. If there are any issues over who gets to control an NPC, then the player to the left of the player fighting the NPC controls it. The player can freely control the NPC, with only one exception: The "Flee" action may not be chosen unless the NPC has less Cannons or Crew than the Player Captain it is up against. In the top-right top corner of the Game Board, you will find an area meant for placing cubes for NPC ships. Place a brown cube on the track of each hit-location so that it corresponds to the NPC ship in question (for instance a frigate would have a cube placed on the third space for all its locations). NPC ships that are not sunk or defeated are replenished once combat has ended. You do not keep track of NPC damage from battle to battle.